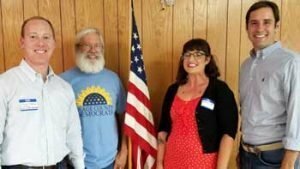 Democrats re-engergize in Carbondale, from left, Ethan Corson, Kansas Democratic Party executive director, Dwight Moore, Osage County Democratic Party chairman, Sarah Coats, candidate for Kansas House District 54, and Joshua Svaty, candidate for governor. 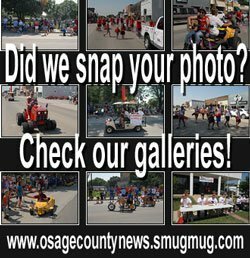 The Osage County Democratic Party held its monthly meeting Aug. 24, 2017, in Carbondale. Prior to normal business, the attendees heard from a few speakers about upcoming elections and state party opportunities. Candidate Sarah Coats, who is running for the 54th district in the Kansas House of Representatives, spoke about her commitment to representing the working people in the district, which includes the northern tier of Osage County. She also committed herself to earning each and every vote cast, a distinct difference from the incumbent in that seat. Coats also spoke about her views on children’s issues and what improvements can be made by the state legislature to support Kansas families. More information about her campaign can be found on Facebook or Twitter at @SarahCoats4KS. The attendees also got to hear from gubernatorial candidate Joshua Svaty, who is currently on a statewide tour to visit with every county. He spoke about the local connections he has to Osage County, and what changes he thinks we could make at a local level that will have lasting impact on our state. When asked what his first priority would be for improving the state, he replied he would first like to see stability brought back to Kansas government so that the wild fluctuations in state services, budgeting and agency staffing will be calmed. He stated he would like the rest of the country see the state of Kansas as a place of solid ground once again. He also said he would like the first issue he tackled to be KanCare, because everywhere he visits that is the issue that is raised without fail. Finally, the attendees heard from the Kansas Democratic Party Executive Director Ethan Corson. Corson is brand new in his position, and spoke with quite a bit of enthusiasm about the energy in the Democratic Party throughout the state. 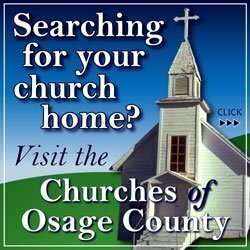 All of the speakers mentioned what a great turnout Osage County had, an impressive group considering the county party only officially re-organized in April. The party can be found on Facebook at Osage County Kansas Democrats. The next meeting of the Osage County Democrats will be at 7 p.m. Sept. 19, in Melvern. Anyone interested in bringing about good changes for the good people in the state is welcome to attend. 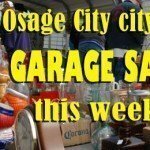 Information and photo thanks to Osage County Democratic Party.